Renaud Herbin offers a new way of looking at string puppets, an emblematic technique of puppetry, which is now approached by the service of a contemporary writing. Poetry of detail, Milieu magnetizes our eyes and attention! Concept and performer: Renaud Herbin Scenic space: Mathias Baudry Puppets: Paulo Duarte Sound: Morgan Daguenet Artistic collaborations: Aïtor Sanz Juanes, Julika Mayer & Christophe Le Blay Light: Fanny Brushi, with the outside eye of Fabien Bossard Construction: Christian Rachner Technical direction: Thomas Fehr Photography: Benoît Schupp Production: TJP - Centre Dramatique National d’Alsace Strasbourg Co-production: Festival Mondial des Théâtres de Marionnettes de Charleville-Mézières Technique: String puppets Language: Without words For audiences over: +8 Running time: 30 min. 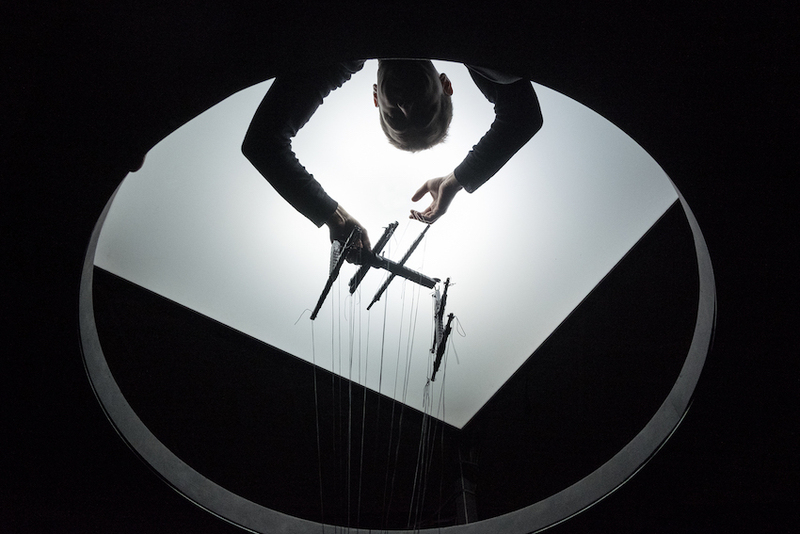 Renaud Herbin offers a new way of looking at string puppets, an emblematic technique of puppetry, which is now supported by a contemporary writing. In Milieu, Renaud Herbin is at more than 3 meters high, above the puppet, which manipulates at a distance, through long strings. 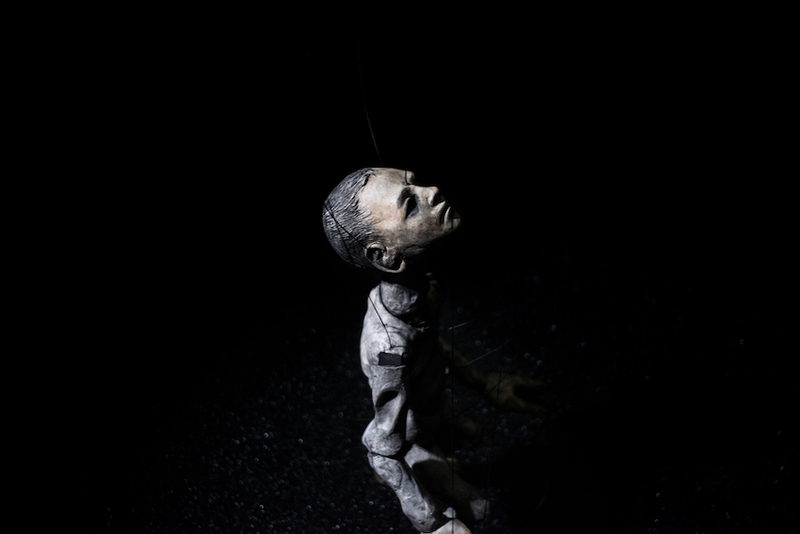 Creator and observer of this new animated world, fascinated and disturbed by this character inspired by Samuel Beckett's The Lost Ones, the puppeteer molds the matter, the form, gives life to it. A man, or more precisely, a puppet, finds himself closed into a giant cylinder, from which it is impossible to escape. In spite of all his efforts, the lines of force refuse to let him out. In the manner of the absurd and grotesque stories by Samuel Beckett, Milieu features an individual's distress, funny and metaphysical at the same time, thus outlining the space. 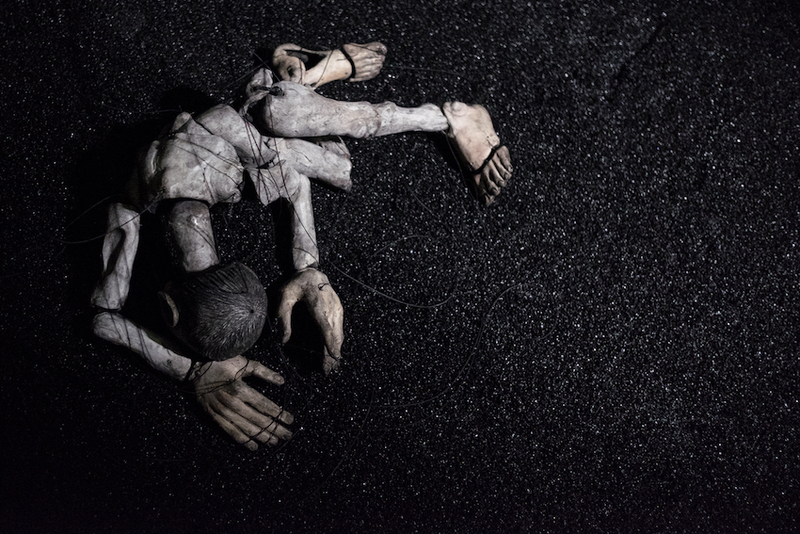 "With Milieu, the puppeteer offers a narrative in abyss, full of subtlety. Placed in an uncertain equilibrium, at the top of a cylindrical structure, the puppeteer gives life to the puppet that dominates radically, while the public surrounds the stage and observes it. Micro history of existence, Milieu (...) happens in a device perfectly adequate to amplify the look. In this new type of castelet, the floor of the puppet is at the height of human eyes, each nuance is driven from above (...). Poetry of detail, Milieu, magnetizes our eyes, even more disturbed, to cross the empty orbits of this small being"
"Renaud Herbin (...) wants to establish a connection between the traditional and the contemporary. In Milieu, the string puppet is the center of an original device. Renaud Herbin conceived a structure of 3.70 meters of height that surrounds the stage, in which its puppet moves. He is at the top, manipulating the strings, with 2.20 meters long. The viewer can move around this vertical booth to see, from different angles, the character and its manipulator (...). The puppet (...) designed by Paulo Duarte, has a body formed by many joints so that its movement is decomposed as finely as possible. Eighteen strings make it move." "Milieu form of Renaud Herbin (30 min), created especially for the 40th Giboulées is a real gem!!(...) 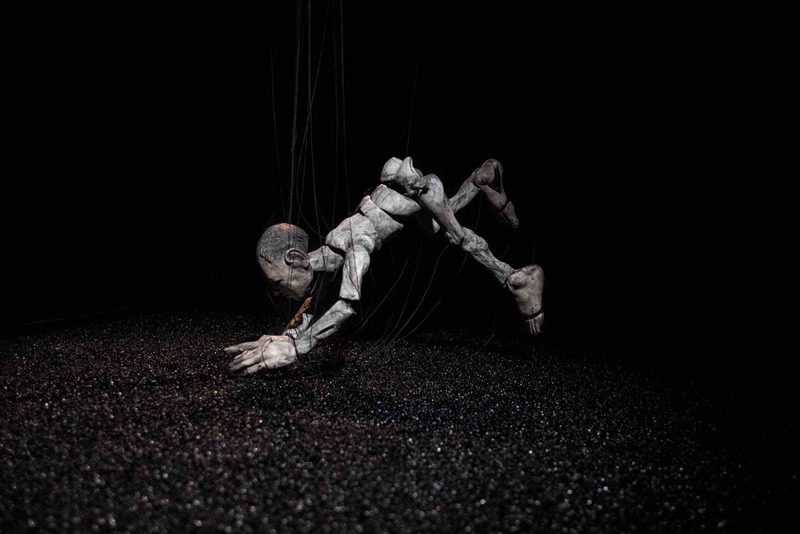 A small skeletal man in motion, a puppet with numerous strings, seems blocked, suffocated, constantly trying to breathe. Moving on a black gravel floor, she tries to get out, get up, talk to the depths of the earth to escape, to finally fly away, suspended in the air and fall... The electroacoustic beats cross her body (...), in the soil that seems to breathe ... Renaud Herbin manipulates this small being, also suspended at 3,70 meters in height, in the booth, sitting or in balance, at the limit of the fall...And the public is also suspended... for so much beauty and delicacy, with so much ingenuity and intelligent research in the art of puppetry!(...) Milieu is a real gem not to be missed during the festival!! - Les Lorgnons d'Obéron, Blog de critique de spectacles. Renaud Harbin is the Director of TJP - Centre Dramatique National d' Alsace Strasbourg, since 2012. He has graduated from the École Supérieure Nationale des Arts de la Marionnette de Charleville-Mézières (ESNAM). Renaud founded with Julika Mayer and Paulo Duarte the company LàOù - marionnette contemporaine. He directed and performed several visual shows, usually from dramatic or literary works. Recently he premiered Wax and La vie des formes was created last summer in Avignon. But also Actéon Miniature (2013) presented in FIMFA Lx14, Pygmalion miniature (2011), Lopin (2008), Mitoyen (2006), Vrai! Je suis très nerveux (2003), Détails, Les grands poissons mangent les petits (2002), Petits Chaos (2000) e Un Rêve (1999). Between 2003 and 2008 he developed the projecto Centres Horizons with the filmaker Nicolas Lelièvre: shows and animated movies about urbanism in the cities of Rennes, Buenos Aires, Berlin Villa Médicis Hors-les-murs 2004). 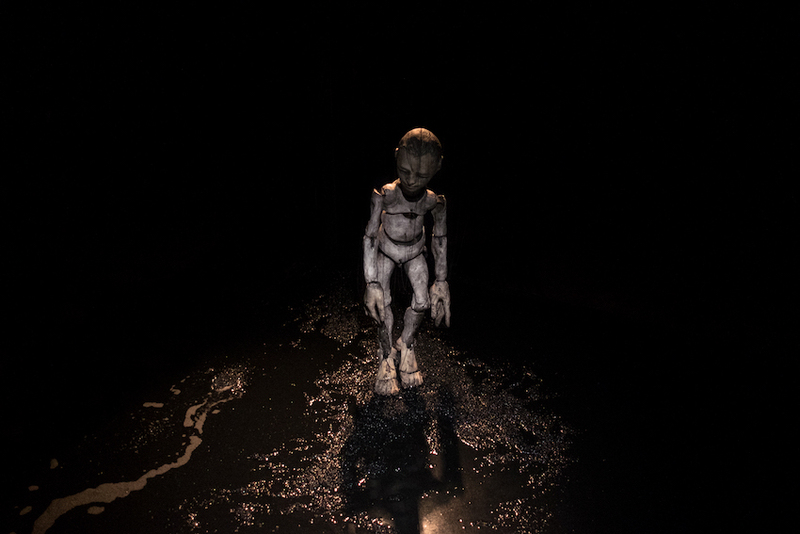 Through its own productions and various artistic collaborations (co-directions with Frédéric Fisbach, Robert Cantarella, Julie Bérès, Charlotte Nessi), mixing theatre, opera, contemporary dance and writing, he develops an unique visual language, placing the idea of manipulation at the center, understood as something that connects artistic fields. In this sense, his creations include the presence of puppets, actors, dancers, sound and images in interaction on stage.